The long skirt has emerged as one of the star items for this summer, so if you consider yourself fashion lovers can not miss one in your closet. Moreover, as we will show below, you can wear them in many different occasions as they wear dark for evening events and bright and cheerful colors during the day. The only thing that must be clear is how to combine. One of the ways that more triumphs when wearing a long skirt is combining it with a basic t-shirt. In this way, the skirt takes the role, the garment star and getting a look very comfortable and versatile for all types of events. Furthermore, the key to this is to combine it with styling accessories that are also bold and give a little joy to the upper part of your look, such as necklaces. Another way to look long skirt that has become very popular this summer is combining with one crop top. 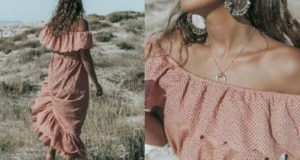 In this way, you get a much more extreme and daring look that is sure that it does not go unnoticed since the crop tops are also causing many trend this summer. This styling women with low hip as much stylized figure leaving the belly exposed. Finally, one look that draws much attention is to wear a long skirt with a shirt or blouse. If you opt for this option and you will get a very elegant styling and striking, especially if the skirt is stamped or a cheerful color. Whatever it is, make sure you have a long skirt in the closet for success this summer. Previous: What bags carry this season?